Could a Compromise Deal See Israeli–Arab Terrorists Released? Official tells Arutz Sheva Bibi taking Jewish Home threats to leave coalition seriously—but would taking the bait cost Bennett dearly? 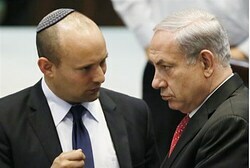 Economics Minister Naftali Bennett provoked mixed responses earlier this month, when he threatened to withdraw his Jewish Home party from the current coalition if Prime Minister Netanyahu gave in to international pressure to release Israeli–Arab terrorists from jail, to revive dying peace talks with the Palestinian Authority. Bennett also urged Israeli Arabs to oppose the move, warning that by allowing the PA to speak for them they would be harming their own position in Israeli society. Some Likud officials shrugged off the threats, as did the Jewish Home’s more left-wing coalition partners, saying Bennett was welcome to leave if he wanted to. Others took it more seriously, warning that toppling the current government would backfire for the nationalist bloc and pave the way for a left-wing government willing to make sweeping concessions to the PA.
And that latter concern appears to be the official position of the Likud establishment. According to a government official, who spoke to Arutz Sheva on condition of anonymity, a proposal has been tabled by the Likud party to reach a compromise which would see Israeli-Arab terrorists released in order to prop-up collapsing talks and stave-off international pressure – but on condition that they be stripped of their Israeli citizenship and summarily expelled. It is a scenario which has been floated from time to time, although the PA has thus far rejected such an arrangement. Possible evidence that the deal was at least being considered were comments made by Jewish Home MK and Housing Minister Uri Ariel during yesterday’s Ramle Conference. That statement was far from a signal of support for releasing Arab Israel terrorists, and arguably was simply his response to a hypothetical scenario—but the fact that he did not reject the idea out of hand was taken as an unwelcome sign of flexibility on the issue by some, including Meir Indor, who heads the Almagor Terror Victims’ Association. “So now they can fly abroad and have the time of their lives while their victims remain buried in the ground …?” he asked bitterly. No one from the Jewish Home party was available to comment on the claims, and it should be stressed that it is not clear if they are being seriously considered by the party’s leadership. The left-wing Labor party has in the past promised to replace the Jewish Home if it bolts the coalition, in order to keep peace talks going and to help promote concessions to the PA from within the government. It is not difficult then to understand why Bennett would seek to find a way to remain in the government and use his position to prevent such an eventuality. But such a move would undeniably be a politically-risky one for the Jewish Home, which is currently riding high in opinion polls, due in part to its perceived no-nonsense approach to Israeli security issues, including staunch opposition to the release of convicted terrorists. Bennett has emerged relatively well from previous spats with Netanyahu’s party. But following a pledge to leave the coalition as unequivocal as the one he made prior to the Pesach holidays, and after deriding PA chairman Mahmoud Abbas for making “empty threats” to dismantle the PA if Israel did not give in to his demands, it would be hard to spin such an agreement as anything other than a capitulation.